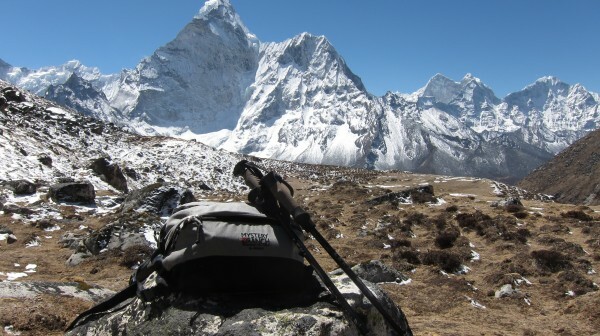 23 days of living out of the Mystery Ranch G-6000 in the Khumbu Valley of Nepal. When planning for my second annual trip to Mt. 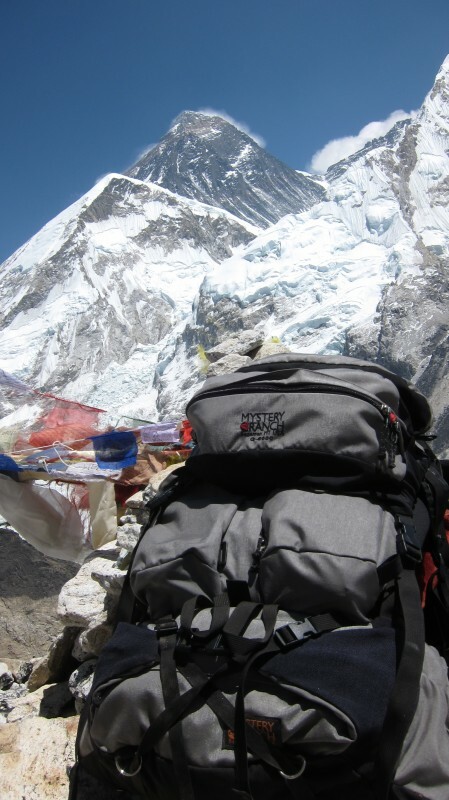 Everest, the preparation and effort required to fulfill the mission of our nonprofit organization far exceeds that required for my personal mission to survive the adventure. Regardless, surviving the trip to Mt. Everest Base camp and living in a tent placed on the rocks and ice of a glacier that moves 1 meter each day at 17,600 feet of elevation is no laughing matter. The mission of the Himalayan Rescue Association – USA (Everest ER) is to provide altitude-experienced compassionate quality health care and preventative education to the climbing community, their support staff and trekking-through public in Mt. Everest base camp, using proceeds from this care to subsidize free/low cost health care for the sherpa people of the khumbu region of Nepal. Raising money, acquiring the medical equipment and supplies, and coordinating the volunteer physicians to staff the clinic requires considerable effort throughout the year. 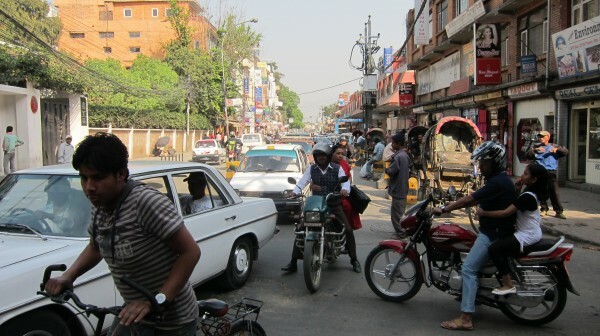 Flying from Bozeman to Kathmandu, Nepal can take anywhere between 30 and 50 hours depending upon airline schedules, layovers and connections. Landing in Kathmandu, it takes no time to realize that Nepal has one of the poorest economies in the world, with about 50% unemployment and an per capita income of about $470 per year. Seeing people living in these conditions not only pulls on my heart strings, it also makes me proud to volunteer time for the Everest Base Camp Clinic, an organization that helps many Nepalis each year. From Kathmandu, we fly to Lukla, one of the most dangerous airports in the world. The runway is less than 1,800 feet long, 66 feet wide and at a 12% incline. At the end of the runway, a large brick wall is constructed. At 9,380 feet, only two airports in the world are at higher elevation. As soon as the plane hits the ground upon landing, passengers lunge forward due to the pilot slamming on the brakes to slow the plane in time to avoid the brick wall. Lukla marks the beginning of the trek to Everest Base Camp. I decided to make the trek unassisted by a porter and loaded the Mystery Ranch G-6000 Expedition Pack with 52 pounds of clothing and gear. I consider myself an “Average Joe”. I am 47 years old, about 6-2, 180 pounds. I am not extremely fit, but I am pretty active. Despite wobbly legs and a load that exceeded my physical ability, I never felt fatigue in my back, my shoulders, or my neck. The pack really did its job keeping the load stable and comfortable on my hips. About six hours later, we arrived in Monjo, where we spent our first night in a tea house. Even though Monjo’s elevation is about the same as Lukla, the trail is never flat and the rocky terrain of the relatively unimproved trail makes everyday challenging. Day two ends at 11,300 feet in Namche, about 2,000 feet higher than Monjo. Most of that elevation is gained climbing Namche Hill. I have used many four-letter adjectives to describe Namche Hill, but it can best be described as two hours of intense agony. I woke up the morning of our trek to Namche with gastrointestinal distress, most likely caused by a bacterial ingestion. The illness sapped my energy which meant that I tasted more agony as a result of Namche Hill. I knew I was in bad shape when I could not keep pace with a porter weighing about 140 pounds, carrying about 250 pounds. About 2/3 of the way up Namche Hill, I reluctantly handed my pack over to a porter and I struggled up the hill between trips to the bushes for relief. After doses of two different antibiotics and two days of rest, I felt ready to move forward. I wisely decided to lighten my load to about 40 pounds, much more appropriate for my level of fitness. 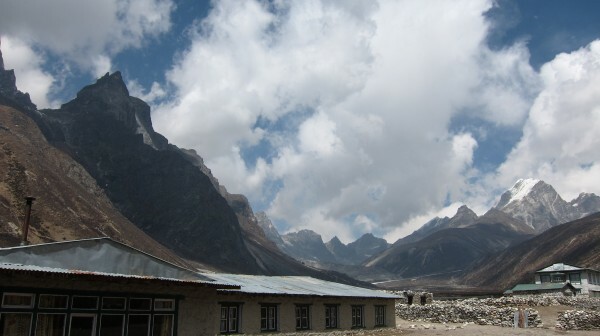 Two days later, we arrived in Pheriche, elevation 13,900 feet where we spent two nights for acclimatization. I weighed myself in Pheriche and discovered that I had already lost 11 pounds! While in Pheriche, someone got a wild idea to hike over Khomba La Pass enroute to Lobache. It did not take much to convince our party, so instead of a 3-hour trek to Lobache, we chose a 10-hour trek to Lobache that included a pass that rose above 18,000 feet. It was definitely worth it because the views from the pass were breathtaking. I took this opportunity to remove the top portion of my Mystery Ranch G-6000 Expedition Pack and use it as a day pack while a porter carried my main pack to Lobache (16,200 feet). The day pack seems small and my doubts about its practicality and comfort were quickly dispelled. I carried everything I needed for the long day hike in high altitude with room to spare. After a long and extremely strenuous hike to Lobache, we assessed our fitness and decided to go straight to Everest Base Camp from Lobache, rather than spending a night in Gorakshep (17,000 feet). We all had a history of acclimatizing well to elevation changes and we felt fit for the 6-hour trip. 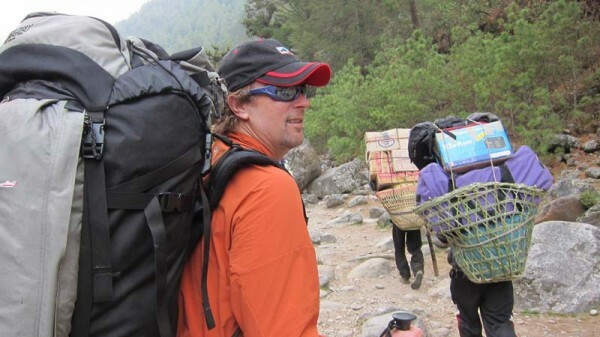 I surprised most people by sending my porter down and taking the Mystery Ranch G-6000 Expedition Pack loaded with 40 pounds on my back en route to base camp. I stayed 10 days at base camp. While my tent and my food were supplied, everything else I carried in the Mystery Ranch G-6000 Expedition Pack. Once we got the clinic setup, I took a side trip from base camp to the top of Kalapathar (18,600 feet) were I saw some great views of Mt. Everest. I carried the Mystery Ranch G-6000 Expedition Pack on this day trip. I was questioned more than once on the hike about whether I was carrying the large pack to make the hike harder on myself. My response was that the pack was so comfortable that I liked carrying it with a lighter load. 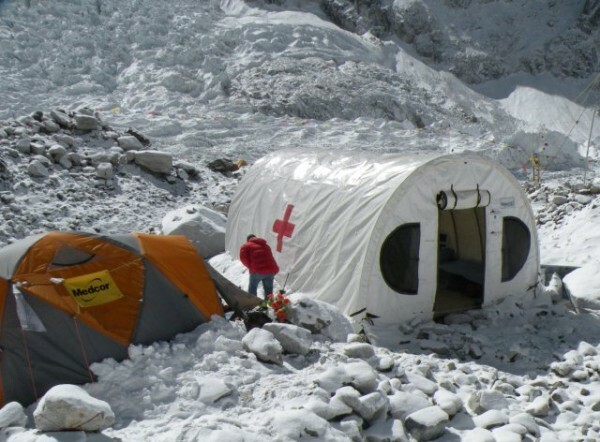 Base camp brought reminders of the hazards or altitude and Mt. Everest. 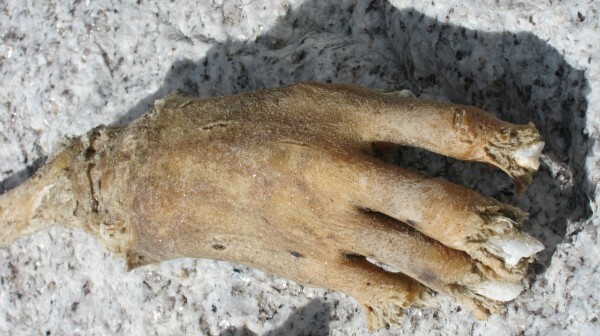 While scouting a suitable location for the rescue helicopter landing pad, we found a mummified arm of unknown origin and age. This served as a stark reminder that people die trying to overcome the elements on Everest. A few days later, we were served another harsh reminder of the power and danger at Everest Base Camp. Feeling the fogginess associated with a mind that is only partially awake, I heard a tentative sounding voice saying, “Hello”. I assumed that it was our Peak Promotion kitchen staff who have spoiled us with coffee and tea in bed. I opened the tent with my outstretched hand grasping for the cup of coffee that I expected. Instead, a Sherpa guide from the Korean climbing team greeted me with a fearful look on his face, stating that he needed a doctor. After those few words, I witnessed a choreographed string of events that resulted in saving the life of a desperately ill man. Dr. Freer sprung from her sleeping bag and called Lakpa, Everest ER’s Logistics Manager, to assess the situation in the guide’s native language. The guide explained their difficulty waking a kitchen worker who was breathing heavily and coughing bloody sputum. Those symptoms signaled a medical emergency that required immediate action. Lakpa, the first Nepali to earn Wilderness First Responder Certification, hustled to the Korean camp to coordinate the transport of the patient to the EBC Clinic, while the medical staff prepared the clinic for his arrival. I got the coffee. The patient, a Rai Nepali kitchen worker from lower elevations, arrived only a few minutes later, riding piggy-backed on a porter. I noticed his grayish-colored face carried an expression of agony and fear. As I saw his bare feet, I could not help but notice that he was a small man, no more than 5-feet tall. My first impression was that he was an elderly man who looked very sick and barely conscious. He groaned when he was placed on the clinic cot as people he did not know began working on him. His blood oxygen concentration was 29%, meaning that his condition was critical. He could die at any minute and without medical attention he would have almost surely died within the hour. Suffering from High Altitude Pulmonary Edema (HAPE), the man’s lungs were leaking fluid and blood, drowning him. The medical team immediately coordinated a drug intervention that Dr. Freer called a “a shotgun approach” that included dexamethasone, diamox, Viagra, nifedipine and inhaled salbutamol. The patient, unaware of the protocol swallowed the bitter pills, groaning and expressing displeasure. It was obvious that every movement he made was very uncomfortable. The 33-year-old man responded quickly to the drug intervention and oxygen, his facial expression still showing fear, but also relief as his blood oxygen level increased to 69 after a few minutes on oxygen. It continued to rise to 92, a level that is considered excellent at an elevation of 17,600 feet. As his condition improved he continually stated, “Thank you, Thank you, Thank you,” to everyone involved in his rescue. He stated that he felt much better and he began to stir around as if he was ready to go back to work. Unfortunately, a severe case of HAPE like the one this kitchen worker was experiencing required immediate evacuation to the lower elevation and medical care at the Pheriche Clinic. As porters prepared a basket to transport the man to Pheriche, he began to dress himself. He was exhausted before he could put one sock on his foot. One porter carried the man in a basket, an easier and safer alternative to a stretcher. 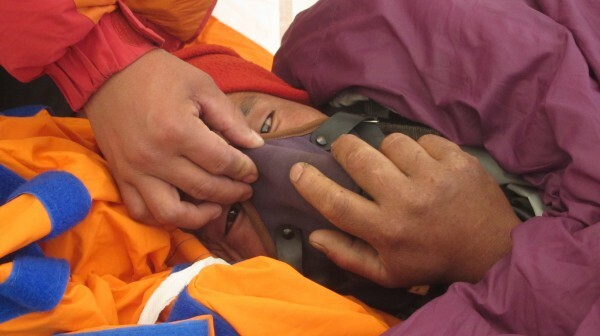 When in Pheriche, he will be given the disappointing news that his health will prevent him from returning to Base Camp and it will force him to avoid high altitude work in the future. The safer way out is in a basket. 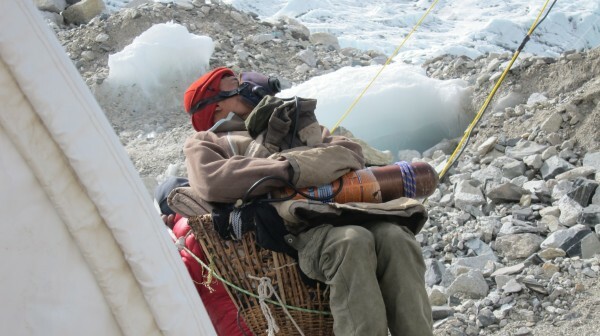 Without the Everest Base Camp Clinic, the chances of this man surviving this illness would have been slim to none. Looking into his appreciative eyes, all the planning, effort and agony felt totally worthwhile.